A World War II Soviet Russian tank fires at a German anti-tank gun. 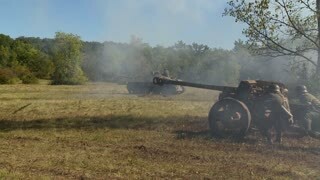 The cannon crew fires at the tank with a blast of smoke across the battlefield. The Germans reload for another attack. Great action. 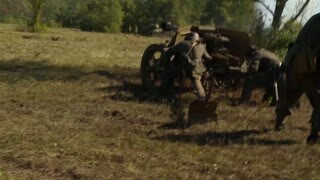 WWII German Cannon shooting at a tank during combat. The Crew scrambles to reload in the smokey chaos. A crew of young German soldiers in WWII guard their anti-tank Cannon, painted camouflage. World War II German tank fires at a distance while an anti-tank gun crew prepares to defend. Armored trucks drive across the open battlefield. Great war action. A German anti-tank cannon gun crew fires across an open battlefield at a Soviet Russian tank. The smoke is thick as the soldiers attack. Great action. A World War II German anti-tank cannon gun crew prepares to fire across an open battlefield. 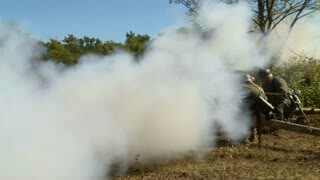 An armored personnel carrier emerges from the smoke. A tank drives over the field. A Sergeant signals his men. Germans attack. Great action. 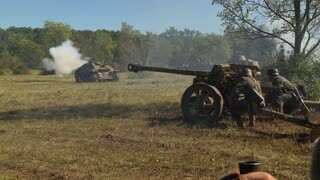 A German cannon crew shoots a Russian tank and reloads quickly in the midst of World War II combat.